Before you put your home on the market, be confident in its condition and worth with a pre-listing inspection. We will inspect your home for undisclosed defects that could compromise your real estate transaction. Don’t be caught off-guard during the buyer’s inspection, and put yourself at a seller’s advantage! You can make repairs at your convenience after the inspection or list your home in its existing condition. Utilize our unique Create Request List™ to simplify the repair addendum, which saves time and money. Protect your investment on your newly built dream home with a new construction inspection from Buyer’s Edge. We are here to serve as a buyer’s advocate and find defects that may have been overlooked during the building process. We will verify that building practices and workmanship comply with industry standards and building codes before the final walkthrough with your contractor. To monitor all stages of the building process on your new home, we offer phase inspections for the four phases of construction – framing, pre-drywall, post-drywall, and final. This inspection ensures that building progress and practices are up to code and in accord with industry standards. After each phase, we will identify deficiencies that need to be addressed by the builder before construction covers these areas, making them inaccessible. As the homeowner of a newly constructed home, you are covered by a one-year builder’s warranty. Take advantage of your builder’s warranty before it runs out. We will perform an 11-month inspection during the eleventh month of your new home’s occupancy to determine if any defects exist within the structure or systems that should be addressed by the builder. Under the warranty, the home builder will incur the cost of repairs, saving you money in the long run. After recommended repairs from an initial inspection are performed, we will verify that any modifications meet building codes and InterNACHI’s Standards of Practice. Protect you and your family’s health, and have your drinking water tested today. We use lab-certified water testing kits to detect the presence of chemicals, coliform bacteria, and heavy elements in your potable water. Don’t let a silent killer lurk undetected in your home, putting you and your family at risk. Radon is a colorless, odorless, and cancer-causing gas that occurs naturally from the decay of uranium in the soil. The only way to detect its presence in your home is with a non-invasive radon test. We are licensed and certified radon specialists through The American Association of Radon Scientists and Technologists (AARST) and National Radon Proficiency Program (NRPP). We will test to verify that radon levels in your home are safely habitable. If elevated radon levels are detected, we can recommend the next steps to take to begin the process of radon mitigation. If radon levels in your home are elevated, we provide radon mitigation and risk reduction services through our company Breathe Well. Don’t live with the dangerous threat that radon gas poses to your health and safety. Contact us to find out how we can keep radon from entering your home or clear your environment of existing radon! Evidence of backdrafting on an oil furnace. This could have been a dangerous situation for the buyer. Double tapped wires are a common defect in electrical panels resulting in poor wire connections and a possible fire hazard. 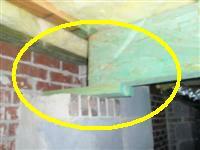 This is not a good way to heat a crawl space and because it was not the buyers intension to do so it was repaired. This is an oil flue in close contact with celouse insulation. This arrangement is not good. Who needs an outlet for an extension cord when you have a wire? You never know what people will do. This is a safety and fire hazard. This is water flooding a crawl space during a heavy rain. This is the result of negative grade outside. The front yard had to be regraded to fix this. Luckily the buyer was saved from the cost. The label on the recessed light states that it gets hot and it should not be in contact with insulation. This is a common mistake insulation installers make and it can be a dangerous one. This could be a major problem. This is a main girder that is not bearing properly at its end. With an inspection, the buyers were able to know about this and get it fixed.